Royal DSM and Sayan Orthopaedics Ltd. have recently announced that Sayan will use braided DSM Dyneema Purity ultra-high molecular weight polyethylene (UHMWPE) fibers in its new orthopedic trauma treatment device. The device's designers chose the Dyneema Purity UHMWPE fiber over stainless steel with the intent of improving patient comfort, reducing potential allergic reactions and increasing flexibility during surgical implantation. The device will employ a braid of several different Dyneema Purity fibers. It is but another example of how ortho materials innovations are advancing next-gen devices. Other examples include nanotube surfaces and silk-based parts. DSM, the US subsidiary of Royal DSM N.V. (Heerlen, The Netherlands) says its Dyneema Purity UHMWPE fibers are weight-for-weight 15 times stronger than steel, so the braid will be able to withstand high stresses. Further, Sayan says, its braid's small diameter, high pliability, and increased flexibility will, in combination with the device's design, allow for easier adjustments during implantation. Since the UHMWPE braid conforms to the shape of the bone, contact surface is increased while contact pressure is lowered. Tissue inflammation and irritation are also minimized due to the fiber's biocompatibility and chemically inert properties. Additionally, the use of UHMWPE eliminates the possibility of complications associated with metal allergies. Dyneema Purity materials are said to have a proven track record for use in both short- and long-term orthopedic implants, including treatments for anterior cruciate ligament (ACL) injuries and in high-strength orthopedic sutures. Izmir, Turkey-based Sayan will be supplied from DSM's plant in Greenville, NC. The ISO 13485:2003-certified facility is the only plant of its kind dedicated solely to the production of medical-grade fiber. The new plant will also produce, among other medical-grade fibers, Dyneema's new Purity 10 dtex fiber, which the company says is the world's thinnest high-strength, medical-grade UHMWPE fiber. 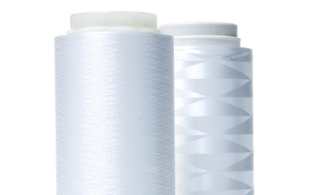 Dyneema says the 10 dtex fiber is four times stronger than polyester and thinner than any other UHMWPE medical fiber on the market. Refresh your medical device industry knowledge at BIOMEDevice, March 26-27, 2014 in Boston.